note:- more Duas and text will be add to this section so re-visit it again.!!! Allahumma innaka Afuwun Tuhibbul Afwa Fa'afu Anna. Follow up a bad deed with a good deed, to cancel it out. "Most of the sins committed by the son of Adam are sins of the tongue." 1.Wudu-Ablution The first practice is to do wudu- Ablution thoroughly, reaching all its defined places and washing each limb fully. Tradition "When a servant washes his face, every sin he contemplated with his eyes will be washed away along with the last drop of water; when he washes his hands, every sin they committed will be washed off from his hands with the last drop of water; and when he washes his feet, every sin towards which his feet have walked will be washed away with the last drop of water. So that he comes out pure from sin." 2. Fard -Salat – Obligation Pray " When the time for a prescribed prayer arrives and a Muslim performs Wudû well and humbly offers prayers with proper bowing, it will be an expiation for his past sins as long as they are not major sins, and that is for all times." 3. saying Ameen- I Believe - Having the "Amen" of the person praying behind the Imam after he finishes the Fatiha-Open chapter of Quran, coincide with that of the angels in word and time, as stated in the Sahih collection. 4A. Jumah-Friday to Jumah"If anyone performs Wudû well, then comes to the Friday prayer, listens and keeps silent, his sins between then and the next Jumu'ah plus those of three extra days will be forgiven. But he who plays with pebbles has caused an interruption." "If one of you tells his brother to be silent while the Imâm is giving the sermon, he is guilty of idle talk." 4B. Dua after Jumah-Friday Salat pray - After the final salam (movement to close the salat-pray) in Jumu'a -(Friday pray) reciting the Fatiha , Surat al-Ikhlas and the last two suras of refuge (112,113,114 of Quran) seven times each before moving from his place and speaking. 5. Praying the Duha prayer with faith and expectation of the reward promised for it, or out of the desire to pray it with sincerity in it, without any showing-off or wanting to heard or seen, or to store up a reward with Allah. ( Duha -supererogatory morning prayer) its reward tradition “ In the morning every single joint of yours must pay a sadaqa. Every tasbih is a sadaqa, every tahmid is a sadaqa, every tahlil is a sadaqa, every takbir is a sadaqa, every commanding good is a sadaqa, and every forbidding evil is a sadaqa, and all this is accomplished through two rak`ats one can pray in Duha." Tradition “There are three hundred and sixty joints in a human being, and he must* pay a sadaqa for each one of them”. ... shall I not give you, shall I not present you, shall I not tell you, shall I not produce in you ten things, by your doing which God will forgive you your sin, first and last, old and new, involuntary and voluntary, small and great, secret and open? ( subHâna-LLhâh, al-Hamdulli-LLhâh, la-ilâha illa-LLhâh, Allâhu akbar ). 8 . Fasting Ramadan with faith and expectation of the reward. "All the previous of any one who fasts the month of Ramadan out of faith and seeking his reward from the Lord, will be forgiven." 9. Praying at night in Ramadan and performing other acts worship and devotion during it with faith and expectation of the reward. 10. Staying up to pray in the last ten nights of Ramadan. "All the previous sins of any one who gets up for prayer during the Night of Power (Laylatul-Qadr) out of faith and seeking his reward from the Lord, will be forgiven." Fasting on the day of ‘Arafa and on ‘Ashura' expiate for minor sins only “It expiates for all minor sins, i.e., it brings forgiveness of all sins except major sins. Fasting the day of ‘Arafa expiates for two years, and the day of ‘Ashura' expiates for one year. 13. Going into ihram -(wearing two pieces of cloth) for the hajj or 'umra from the Masjid al-Aqsa in Jerusalem. 14. Going on hajj to Makka for the sake of Allah Almighty and to obey His command. 15. Performing the practices of hajj and ' umra in full while other Muslims are safe from his limbs and tongue. “Whoever makes pilgrimage to his House (Ka'bah) and does not have sexual relations with his wife nor commit sins (during the Hajj) will return (sinless) the way his mother bore him." 16. The prayer of the two rak'ats at the station of Ibrahim after the tawaf . 17. Standing at 'Arafa and the Mash'ar al-Haram in the hajj . –these are some of the rituals of Hajj. Huwallaa-hullazi Laaa-'illaaha 'illaa Huu: -'Aalimul-gaybi wash-shahaadah; Huwar-Rahmaanur-Rahiim. Whoever reads Above Verses of Hashr reads this in the morning, seventy thousand angels shall seek forgiveness for him till the evening and whoever so reads it in the evening then seventy thousand angels shall seek forgiveness for him till the morning and if he passes away then his death shall be recorded as that of a martyr. 20. Teaching one's child the Qur'an. 21. Saying "Subhanallah wa'l-hamdu lillah wa Allahu akbar " (Glory be to Allah. Praise belongs to Allah and Allah is greater) 1000 times. 22. Saying the words, "Glory be to the One Who possesses the Kingdom and the Domain. Glory be to the One who possesses Might and the Jabarut. Glory to the Living who does not die, All-Perfect, All-Pure, the Lord of the angels and the Ruh," ( Subhana dhi'l-Mulki wa'l-Malakut. Subhana dhi'l-'izzati wa'l-Jabarut. Subhana'l-Hayy allahi la yamut, Subbuh, Quddus, Rabbi'l-mala'ikati wa'r-Ruh ). If anyone says once a day or once a month or once a year or once in a lifetime, Allah will forgive him his past and future wrong actions. 23. Saying "There is no god but Allah, Muhammad is the Messenger of Allah" with sincerity. 24. Counting forty waves in the sea while saying " Allahu akbar ". 25. Manning the frontiers of the Muslims. 26. Hurrying to fulfil a need of a Muslim whether it is fulfilled or not. 27. Removing thorns from the road. 28. Illness while in exile. 29. Shaking hands with Muslims who love one another for Allah with the prayer on the Prophet. 30-31. When eating food or putting on a new garment saying, "Praise belongs to Allah who fed me this food," or "Praise be to Allah who clothed me in this garment and provided for me without and strength or power on my part." 32. Guiding a blind person for forty steps. 33. A man reaching the age of ninety while a Muslim. 34. Saying the supplication of al-Khidr with sincerity and humility: It is: "O Allah, I ask Your forgiveness for every sin and I turn to You from it. Then I return to you and I ask Your forgiveness for all that my self promised You and did not fulfil, and I ask Your forgiveness for every action I intended to do for Your sake and then others became mixed in it for me. I ask Your forgiveness for every blessing You gave to me which I then used to help disobey You. I ask Your forgiveness, O Knower of the Unseen and Visible worlds, from every sin I have committed by the light of day or in the darkness of the night, in a group or alone, secretly and openly, O Forbearing." 35. Dua-prayer in the Adhan (the call to pray )-When someone hears the adhan-call to Pray, and hears the shahada- testimony to faith, in it, he should say, "I am pleased with Allah as a Lord, Islam as a deen Religion , and our master Muhammad as a Prophet and Messenger." 1. Saying "La ilaha illa'llah" 70,000 times. No god except God" and lengthens his pronounciation intending thereby to magnify God, God will forgive for him Four thousand grave sins with it, and if he did not commit Four thousand, God will forgive the difference for his family and neighbors. It is related in the hadith: "Whoever says "No god except God" and lengthens his pronounciation intending thereby to magnify God, Four thousand of his sins are astruck thereby from the register of his sins." 2. Saying "Subhanallah wa bi-hamdihi" 1000 times after Subh . 3. 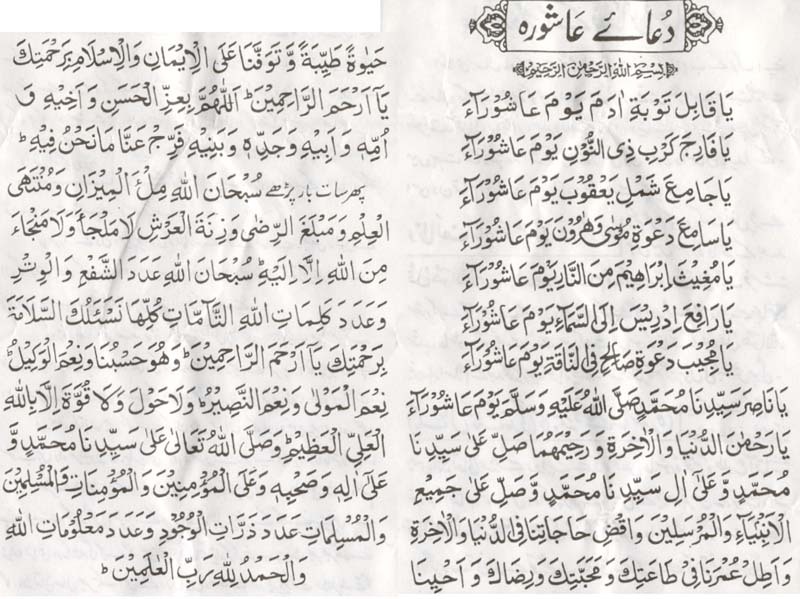 Reciting Surat al-Ikhlas with the basmala every time or once at the beginning 100 times, or 1000 times, or 100,000 times. 4. Saying "La ilaha illa'llah wa Allahu akbar " 4 times. 5. Saying "O Allah, I testify to you and to the Bearers of Your Throne, Your angels, and all Your creation that there is no god but You alone with no partner, and that Muhammad is Your slave and Messenger" 4 times. 6. Reciting the Fatiha with the basmala . 7. Reciting 100 or 1000 prayers on the Prophet using any of the expressions related from him. 9. Saying " al-hamdu lillah " 1000 times after the Subh prayer. 10. Saying " Ya Latif " 16,641 times. It is said that what is meant are minor sins in particular based on the other position that the major wrong actions are neither forgiven nor expiated by righteous actions except by repentance or bounty from Allah. Repentance is encouraged in ayats and hadiths . If a good action could expiate all evil deeds, there would be no need for repentance and and the stress on avoiding major wrong actions in some hadiths . Then there must be no disagreement in what is reported by a sound text which makes something particular or is general. One must follow the text and act according to it in its proper place. According to the statement that the statement is general, if there is something which expiates, then it expiates all wrong actions. Then if there is another action which expiates and it does not coincide with it, then good actions are written for him and he is raised up some degrees. It is the same when it is said that it is particular when the action does not coincide with any of it. If it coincides with one or more major wrong actions and not with a minor wrong action, then we hope that major wrong actions will be lightened for him the small amount as they are lightened for minor wrong actions. See the commentary on Muslim by an-Nawawi and the Fath al-Bari by Ibn Hajar. All of this refers to actions which are accepted by Allah based on what al-Bukhari reported in his Sahih collection where the Messenger of Allah, may Allah bless him and grant him peace, said "Do not be deluded and commit a lot of bad actions based on the assumption that prayer will expiate them, The prayer which expiates sins is the one which Allah accepts. How will the slave of Allah know that?"